Belize & Jamaica: Powerhouses in World Class Softball! 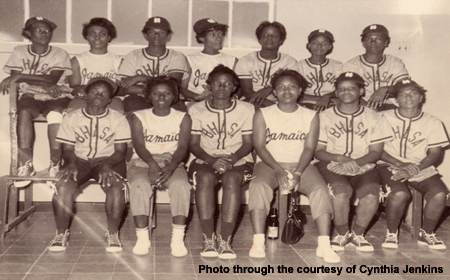 The legendary Belizean softball player, Cynthia Jenkins, graced this classic photograph of an historic battle of champions in the Caribbean between Belize and Jamaica in softball; memories of these sports reports on Radio Belize touched many Belizean hearts and inspired many future Belizean softball players of the late 1960s. It is most inspiring for me to remember this period through reading an article by the legendary softball coach, the late Collet Gill, in a Belizean magazine about these heated softball games between Belize and Jamaica. They were the two formidable rivals of the game in the historic 1968 and 1969 periods of Caribbean softball. One such report stands out for me as Gill described in the most literary light, as if one was seeing it, the highlights of the 1969 CAST GAMES at MCC Grounds in 1969. My ear was like an antenna listening to Radio Belize as a boy with the late Lindy Rogers bringing the highlights of the action-packed game. He wrote that as Belize was beating Jamaica by one, “Sanchez,” the Jamaican coach, went for his best batter to tie the game against the blistering speed of the legendary Belizean pitcher of Belize’s national team, Consuelo Dougal. The fearless Dougal was striking out some of Jamaica’s best players in that game. Gill wrote that as Dougal began pitching against Sanchez’s best hitter, Dougal’s lightning bolts got her two strikes up on the Jamaican. Gill wrote that Dougal looked out at the hundreds of Belizean fans that had packed the MCC Grounds that night, and then threw one of the most devastating pitches of her life that struck out the Jamaican player. He later remarked that it was the same Jamaican coach that gave Consuelo the name, “The Panther”. He went on to say that as Belize won the championship game at that moment, hundreds of Belizean fans stormed the field in celebration of a great victory that was won for country and people by an outstanding Belizean softball team of 1969. The photograph here depicts that solid rivalry between two of the Caribbean’s greatest softball teams of the entire 1960s. But it was a rivalry that was fueled by national pride and excellence in the sport through grinding practice and painful endurance to be the best. The picture expresses a kind of unity in competition rarely seen among champions of today in Belizean sports. It relates an historic moment that brought to view in the photo the great Belizean softball player and catcher, Brenda Johnson, in her young athletic life. The photo also brings immediately to view the outstanding pitcher, Cynthia Jenkins, who pitched for team British Honduras before Consuelo Dougal became a star of the 1969 CAST GAMES. This moment of Belizean softball history will forever be cemented in the hearts and minds of Belizean sports enthusiasts. Though these times may never ever return its nationalistic pride we once felt as British Hondurans, we at least have these memories that make the present worth the while.